Dental offices are frequent buyers of DiSC profiles, at least by our sales numbers. They use DiSC to create a better working environment. Often everyone in the office will discover their profile and new employees will be asked to take the assessment. It makes it easier for the new employee to learn the relationship ropes and be able to focus more on learning operational policies. But we learned from one of our customers that she uses Everything DiSC Sales to train doctors to interact more effectively with their patients. How about using DiSC to improve the doctor/patient relationship? Who wouldn’t like their doctor, nurse or social worker to communicate with them in their preferred style? What healthcare professional wouldn’t like to learn how to better persuade their patients to make lifestyle changes, have a procedure completed, take their medications or follow their recommendations? Providing great health care includes creating a great relationship. Even with 15-minute appointments, the quality of your relationship with your patient will contribute to how influential you can be. Patient-centered care begins with the relationship. Providing great health care is often a sales job. Just like in sales, you’re looking for the real problem that needs to be solved. You need information from your clients/patients. You need to gain their trust. You need to convince them to buy into a treatment plan. Or you need them to buy into a health maintenance plan. The plans might not be a tangible product like a car, but it is a concept or set of actions you need to sell. The first step is to know your own preferred communication style and to realize that it will not be effective with many of your patients. Perhaps you like to move at a fast pace, going directly to all the facts. That style will not work with everyone. You might be able to expect other staff to work with you using this style, but you can’t expect it of all your patients or clients. The second step is to know what other styles people might have and how to recognize them. This is where Everything DiSC Sales can be a huge help. It will help you get a quick read on someone’s style. The report includes a list of behaviors that help you identify each style. That will be enough for you to react by changing your pacing. With your D-style patients you’ll know to give concise information and refrain from social niceties, for example. With your S-style clients you’ll know to use a slower pace and show your warmth and genuine concern for their well-being. adapting your sales style to your customer’s buying style (including customer mapping and interaction planning). 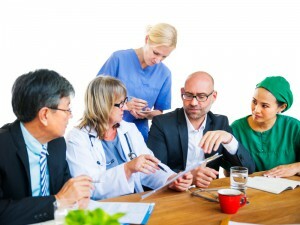 Conflict occurs in every workplace but can be especially destructive in healthcare settings. Everything DiSC Productive Conflict addresses one’s reactions to conflict before the conflict occurs. By looking your own automatic thoughts that pop up during conflict, you can better prepare for future conflict and be more productive in those difficult situations. 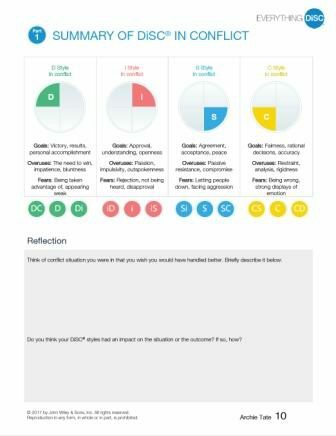 The profile helps teams understand how each of them might be experiencing conflict and reacting to it. It can help those with a C or S styles become better at engaging in conflict and can help the D and I styles pull back their intensity. Since the medical profession uses their own vocabulary, you’ll need to translate some of the DiSC reports. For example, you’ll want to encourage participants to substitute the word “patient” for “customer”. When they read something like “I try to guide my customers rather than give them the hard sell” you’ll want them to translate that to “I try to guide my clients and insist only when timing is critical.” You’ll want to initiate a discussion on how patients differ and don’t differ from customers if it doesn’t immediately come up. You might include a discussion on how staff could try to identify the style of patients during intake. If one person has a hard time with strong S-style clients, should someone else to assigned? How can doctors and staff can help each other adapt their own styles in response to both patients and each other? 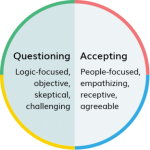 Spectrum Health’s employees use behavioral assessments to improve communication between themselves, colleagues, and patients.